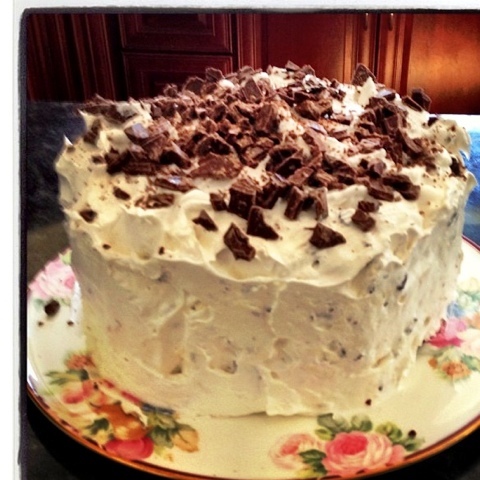 Hope you are in the mood for baking a cake :) Last night we had a big lasagna dinner, all the kids were here including the college boy.. My daughter made for dessert one of our family favorites, this candy bar cake. It is so good ! To make the cake you just need a box chocolate cake mix, we used devils food and bake it in 2 or 3 round cake pans. We used 2. Let the cake totally cool after baking , and make this frosting. Beat cream cheese and both sugars until creamy with electric mixer. Chop 8 of the candy bars and add them and the cream cheese mixture to the cool whip . Use the frosting in the middle of the 2 or 3 layers and all over the sides and top. Chop the last 2 candy bars and add to the top. Make sure to store in the refrigerator. 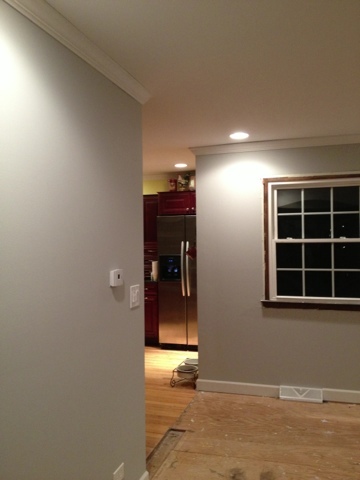 In the remodel progress the crown molding and the baseboards got installed. They still have to put the trim on the windows . We have to putty all the nail holes and caulk , then paint all the trim. We did get a huge surprise last night though, when one of the carpentry guys asked why we have carpet covering our oak hardwood staircase .. We had no idea the stairs are oak under the carpet , and we planned on putting hardwood stairs in later this summer ! So hopefully soon we will get to rip the nasty carpet off the stairs ! Have a great weekend ! Thank you for stopping by and your nice comments ! Yummy!!!! This cake looks amazing! 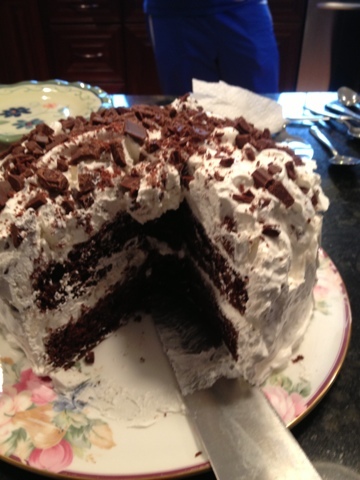 I love the idea if a chocolate bar cake, and that icing looks fluffy and delish. Oh that looks so yummy. enjoy your cake. That cake looks great! The remodel continues to look good! That cake looks so good! I will have to make it! The house is looking great! Can't wait to see it done...and I bet you can't wait for it to BE done!! What a way to start my day!! Your cake looks so tempting, Priscilla! I tried to pin this from the Fox Hollow Cottage/Debbiedoos party, but I can't pin the pic of the cake... only your featured buttons show up, so I thought I would leave a comment instead! Love your new crown molding! Oh, your cake looks marvelous. Here I've just had breakfast and now I'm craving cake! :) Good luck with your projects this weekend. Oh Priscilla, I have this yummy recipe but haven't made it in ages. Yours looks so pretty! Thanks for sharing with SYC. I am in the "danger zone" with that cake - yummy! I could eat the whole thing, but I might try it anyway and test my willpower - lol! Thanks for sharing. Oh my, that looks sooo good! My first Craigslist shopping !